Palm Trees is an imposing hillside villa/guest house set in its own grounds on the gated Tropical Sunshine Estate on the Jamaican South Coast. It is about 200 feet above sea level and 400 yards from the beach. The views are amazing and there is normally a relaxing breeze. All the rooms have high cathedral ceilings and fans. Palm Trees has been extended so that staff are on site for added security and to maintain the pool and to cook meals if required. The owner and staff accommodation is on a lower level so our guests privacy has not been compromised. 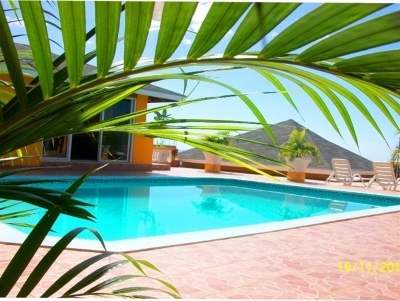 Guests accommodation is the entire upper deck of the villa, over 6000 sq ft, including bedrooms, patios and pool area. The lower deck of the villa is the owners residence and they are normally on site. Any problems they will be there to sort things out. Bernard and Daisy or their helper will ensure the patio areas and pool are kept clean. There is a very large lounge/diner separated from the kitchen area by a breakfast bar. The master bedroom suite has it's own shower/WC and lounge area. Bedrooms 2 & 3 have a shared shower. The verandas are well furnished and there is a B-B-Q if required. We can offer breakfast and evening meal at cost price. Alternatively you can purchase your own supplies and if required Daisy will cook for you at no extra cost. If required room cleaning and laundry will be undertaken at no extra charge. -Guest House Rates Including Breakfast: $75.00 US per person per night. -To secure your booking a 25% deposit is required & balance payable 28 days before arrival. -Our preferred payment method is via PayPal. -On leaving the airport take the A1 towards Lucea and Negril. After about 4 miles at Reading turn left onto the B8. -Keep on the B8 through Anchovy, Montpelier, Haddo and Whithorn until you reach Ferris Cross on the South Coast. -At Ferris Cross turn left onto the A2 and head southwest towards Whitehouse passing through Cave, Mearnsville, Bluefields, Belmont and Auchindown. -On the right you will see the entrance to Sandals, Whitehouse. You have only just over a mile to go. -Look out for the anchor at the entrance to the Tropical Sunshine Estate. -Turn left into the estate and then after about 100 yards turn left, after about 200 yards keep left on a right hand bend. -Palm Trees is the last property on the right.